Working with PHP on OS-X requires tips and tricks if you want to maintain your sanity. Tarn Aeluin has a similar post for the world of Java on OS-X. I was recently playing around with Magento 2, an open-source eCommerce solution, and had enough trouble that I wanted to be sure that everything I learned would be handy for myself and anyone else that thought they had PHP working ok, but had a few things to enable. As with my Java post – I’m going to keep adding to/updating this over time. Note: I’m specifically writing about PHP on OS-X El Capitan (10.11.3). Tips and tricks below may or may not work on other versions of OS-X. The machine I’m using is a MBP (MacBookPro11,3) that I use for most of my development work. On this machine I have Apache httpd 2.4 with a fairly generic configuration. I’m using the version installed with OS-X. My laptop has 16GB of RAM and plenty of SSD space for disk. Apache is still running under the OS-X security configuration (I have to sudo to restart it for example), but I have mapped the webroot to a directory under my user’s home directory. Now you know where to go change the main php.ini configuration. Homebrew keeps things pretty tidy as well by managing the .ini files for all your extensions. I hinted above at the location where homebrew places things. Check /usr/local/Cellar and you will see everything there. Neat and tidy unlike my actual cellar. This setting will basically allow .htaccess files to be used in any sub-directory of my webroot. Handy when you are installing and playing with many tools like Drupal, WP, Magento 2, etc. Not so secure however. It is important to also look at how many PHP parameters including redirect settings and OpenSSL parameters can be set in various files including .htaccess files. Parameters can be set only in php.ini, or in a combination of php.ini .htaccess files, as well as other locations. 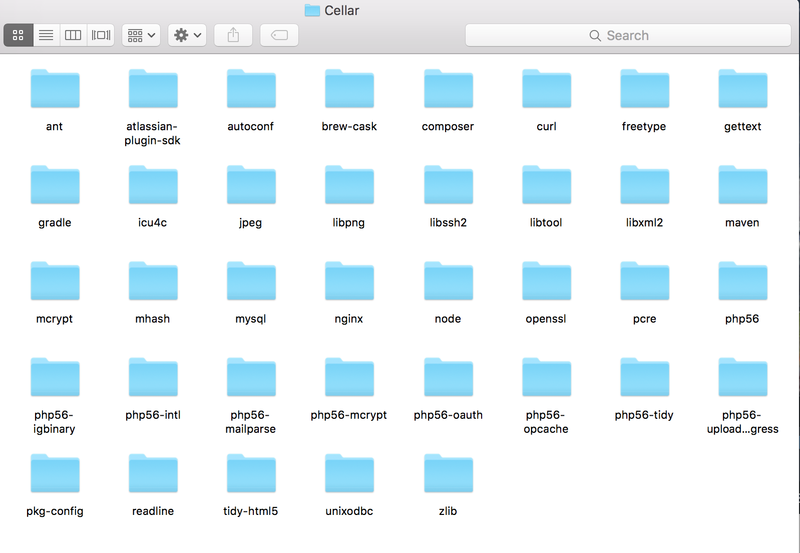 There are a lot of dependency management tools – I suppose the oldest is PEAR – but I’ve come to think Composer is the best of them, whether you are using PHP on Linux/Windows or PHP on OS-X. Many tools that I’ve been using recently use Composer. Symfony2 in particular makes heavy use of it and now I’m also using Magento 2 that also uses it. You can use the installer from the Composer page, but I’ve started to install everything with Homebrew – and yes they have support for Composer! Why use Brew? Two reasons. Brew will setup all the links so that you can run composer globally. Brew will update Composer if there is an update when you run “brew ugrade composer”. Either way – once you have it installed it is simply a matter of getting some code and then running “composer install” in a source directory that has a composer.json file. When you run the install you will see that composer reads the composer.json file and grabs all the packages listed in there and downloads them. Inside the .json file the versions for each product are specified. Once installed then you can use “composer update” to check for any updates. Each time the .json file is updated in the code you can then easily update everything. but that won’t do you any good if the project repository you are trying to connect to is only available via https, which is the case with Magento 2. There’s not a ton of information about how to fix this issue on the internet. Here’s a gallery of the various errors I was getting with captions explaining what to do or what was causing each of them. This is an indication that OpenSSL is not enabled in your PHP install. Use brew to add the extension. Nice try – this is the message you will get when you try to turn off HTTPS with Composer. You can also get this message if you have an http addres in your composer.json repos section. If you do then delete it and try again. This is an indication that there is still something wrong with HTTPS connections. Use php -i to double check that OpenSSL is working. Ah – this is good. Its working, but Composer cannot write the certificate to the path listed. Check that it exists and that the permissions are correct. That was a bit of a pain – especially that one about the cert being “missing” when it was really that the folder it was trying to write to did not exist. Why that odd directory? That was what I set as my temp directory in php.ini while I was debugging all this stuff. To get CSS minimization working do this. I do also use Sublime quite a bit for quick edits and changes or when just poking at code in an open source tool like WordPress or Drupal.